An example of a garden collage. A Garden Design Collage is a collection of plant pictures glued on a page or printed from your computer to see how plants look together. This collection is not only fun and creative, it is the visual aid that many of us need to see how the landscape will look once it is established. With this collage you can see what plants complement each other and how to create a succession of color in one area. It also temporarily satisfies the urge to plant a garden before you know what you want. Grab your glue stick, scissors, a Park Seed, Wayside Gardens, and Jackson & Perkins catalog and start your collage! Also, start a Pinterest board and pin all the landscapes you love. Plan your garden before purchasing your plants. Take the time to research plants, know the soil they need, the zones that they grow best in, moisture requirements, pH and sun exposure needs, deer resistance, and pollinator attracting qualities before they are even considered as a new family member. Spend as much time designing your outdoors as you do your indoors. Personally, I wouldn’t buy a gallon of a paint and bring it home to figure out where to put it. When I am going to paint a room, I bring home paint chips and tape them all over the walls, I look at them in different light. When I get close to the color I like, I get a sample of the paint and brush it on the wall in different locations. This is what you can do with collages for your landscape. 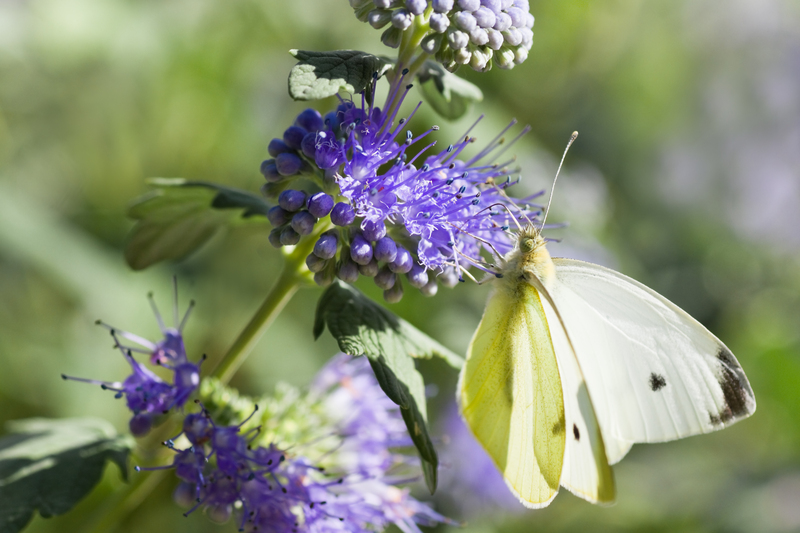 Pollinators have to figure out how to get in each flower. 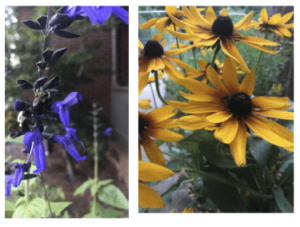 The Salvia on the left has a much different flower than the Rudbeckia on the right. Make it simple by planting large patches of the same flower. If you are going to do your own landscape design, begin by learning plants that are native to your area and create the ‘bones’ of the garden with some native shrubs. Your local chapter of Native Plant Society will be your best source of information. 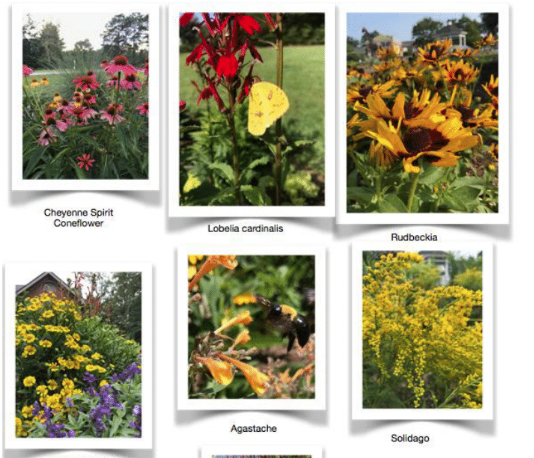 These are often the best plants for native pollinators and wildlife because they grew up together and provide the best nutrition and food for them. You can also research native plants for your zone or region online. I’m a big fan of having mentors! Find someone in your community that is an expert or enthusiast in native plants and ask them for five of their favorites. Even with a great amount of research you may still find a plant that doesn’t want to live in your garden or is not happy where you planted it or just does’t look good where it is. This is the fun part of Pollinator Landscaping. IT’S NEVER DONE! Do your best on your initial design and let the plants tell you whether they are happy or not. Once you get these living organisms in your landscape they WILL ‘talk’ to you. You will discover some are bullies and some play well with others. Some might spread politely, others will take over. Some will reseed perfectly, others you might have to move if you want to get rid of them. 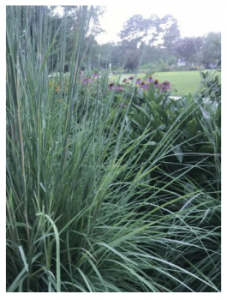 Don’t underestimate the beauty of native ornamental grasses in the landscape. So what is your selection of native shrubs? I don’t have all native plants and sometimes just a few can help wildlife. If you feel intimidated by the prospect of garden design, start with a small area and apply the principles there. You don’t need to take everything out and start over. On these collages you can add the size of the plant and bloom time. You might also add picture of wildlife that will visit like the monarch on the milkweed. You could add pictures of the plant in flower, along with its corresponding fall color and berries or other unique aspect. I placed bright yellow fall leaved Clethra under my bright yellow fall color elm for a ground to sky yellow glow. This isn’t a garden to be enjoyed just in bloom. How about favorite perennials or ornamental grasses? 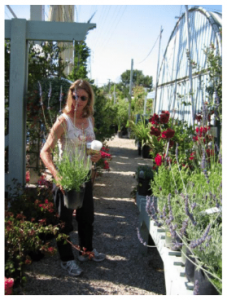 Once you have your native shrub selection and collage, move to perennials and grasses. 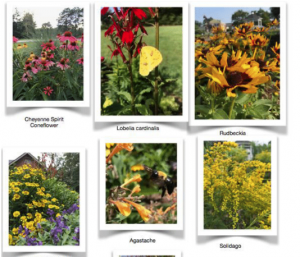 Some of mine are: Echinacea, Asclepias, Rudbeckia, Helenium, Heliopsis, Aster, Solidago, Monarda, muhly grass, little blue stem, and Lobelia cardinals. These are all native perennials and grasses in my area. A typical garden design like this may be difficult for a homeowner to visualize. 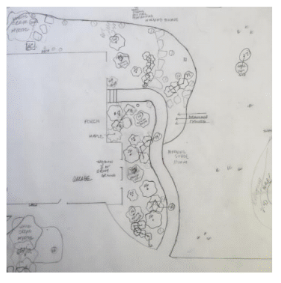 These designs are crucial for installation and sizes but a collage can help us visualize the plants. Many of the flowering perennials are tucked into the landscape in large 4 to 5′ diameter patches for pollinators. It is much more efficient for them to work on one flower species then a collection of different flowers. Every flower has a different entrance to its pollen and nectar so this helps the pollinator to be efficient and use less energy. It also helps in pollinating the same plant species. Another collage can be landscapes you love that you pinned on Pinterest or cut out of magazines. This is the LOOK you want in your landscape, not necessarily the plants. Begin with your collages of native shrubs, perennials, ornamental grasses, and landscapes that you love. Collages are fun and exciting. From my own personal experience, the research, learning, and design ideas were almost more fun than the garden itself. It was certainly less labor intensive! The anticipation and excitement should not be underrated here. 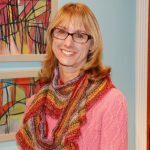 Once you have your collages ready, then we can begin to design. My next article will be on how to take the collage and make it a reality.